Birmingham International Airport Lounges - Compare & Save. Book online now to reserve your seat at our Birmingham Airport lounge for some relaxation and comfort before your flight. Our booking system is user-friendly and convenient for all travellers. What's more, our airport lounges will make you feel right at home. 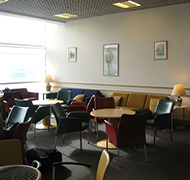 The next time you travel from Birmingham Airport, make sure you book into their airport lounge before your flight. You'll be able to relax with other travellers, browse through newspapers and surf the Internet at your own leisure. This airport lounge is ideal for single travellers, businesspeople, and families. 4 Deck Lounge: Escape the crowds and relax in this modern airport lounge. Free drinks and snacks as well as faultless customer service from the staff. Servisair Executive Lounge: Servisair have a great reputation for the quality of their lounges and this one is no exception. 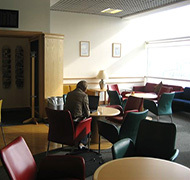 Offering free wifi and disabled access, this lounge is also child free. 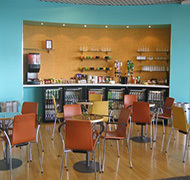 Avoid the crowds and the usual rush of airport travel by booking into our Birmingham Airport lounge. Our services are available to all travellers and you will be able to unwind with all the facilities you need before you fly.